I’ve been meaning to sew up this pattern since it was released a year ago as it looked like a great breezy summer piece. In the meantime I saw a few jumpsuits with a button details down the front, which I loved. I decided to hack this pattern by creating a button placket instead of the zipper. This did go on my make nine plans and I thought I would sew it up this summer. However with the monthly stitch challenge it jumped to the top of the list. 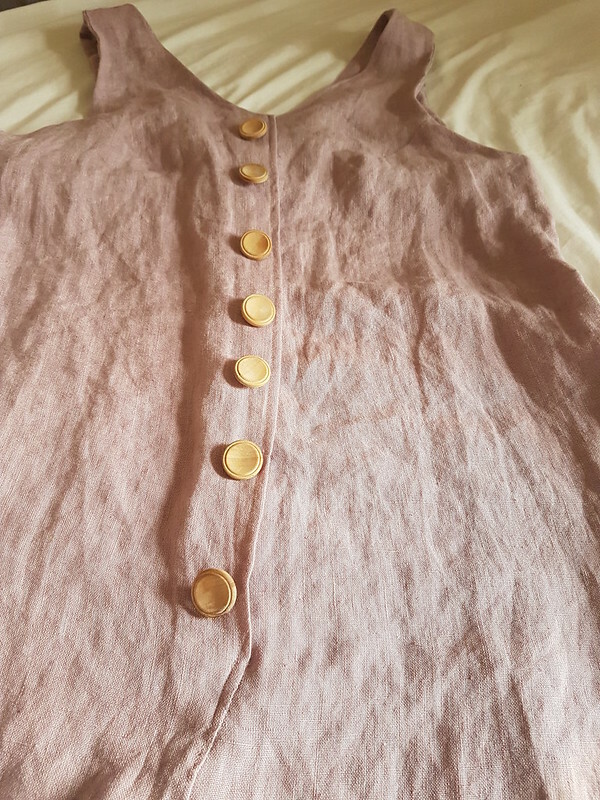 Adding the button placket was a little bit of a head scratcher for me – but google and reference to other patterns helped me out. Otherwise it is a truly simple sew, and I decided to take a little bit more time on it. I am really happy with how the insides look – these are my neatest unlined insides ever I think. I french seamed the side seam and did a little fake french seam on the lower inside leg seam so even if I roll the leg up it will still look pretty. 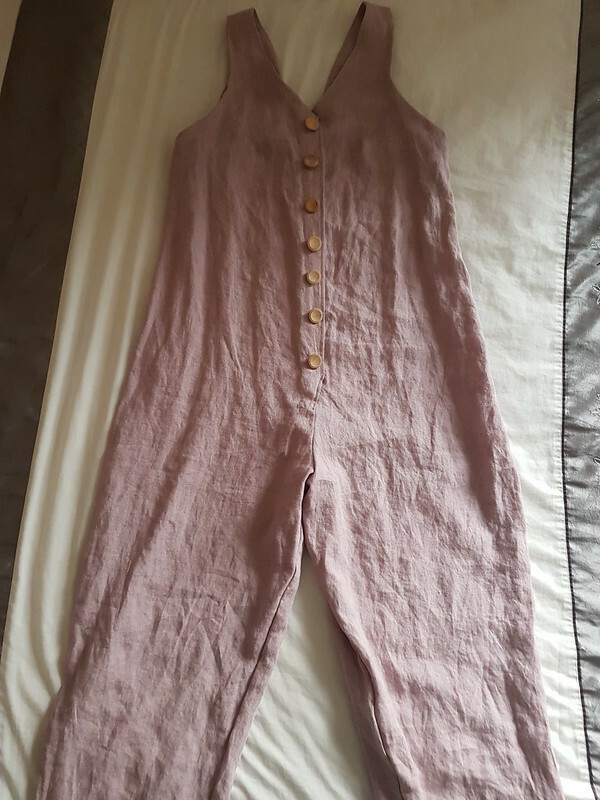 I was keen to make it in a pink linen and I looked at a lot of options online. 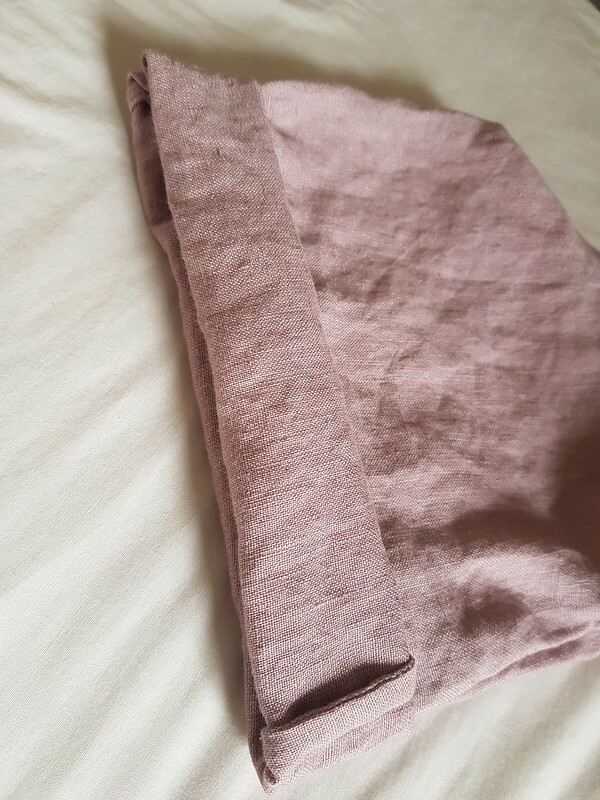 I eventually settled on some Merchant and Mills linen that they described as “pale pinky grey with a slight lilac tone.” It is really difficult to describe the colour – it seems to change depending on the light, sometimes it is pink, sometimes it is grey and sometimes it is purple. Its not quite what I was expecting but it is gorgeous. The fabric itself was amazing to sew with as well, and I would definitely recommend it, if you wanted to treat yourself to some linen. Hopefully summer will be nice and warm again this year. I am not concerned about the fit as they are very loose – straight down from the armsyce to the hip – no waist definition in the pattern at all, so I should fit into them no matter what (fingers crossed). I tried them on, and of course, there was a comical gap over my belly, but the crotch depth seemed to fit well. The pattern is drafted for someone 170cm tall and I am 172cm. The legs seemed quite long. It is difficult to see my feet at the moment but I think the legs were breaking over my feet rather than cropped at the ankle like I was expecting. This will be an easy fix in summer if I want to change it. Description. A relaxed and loose fitting jumpsuit with a v-neck front and back and waist sash. 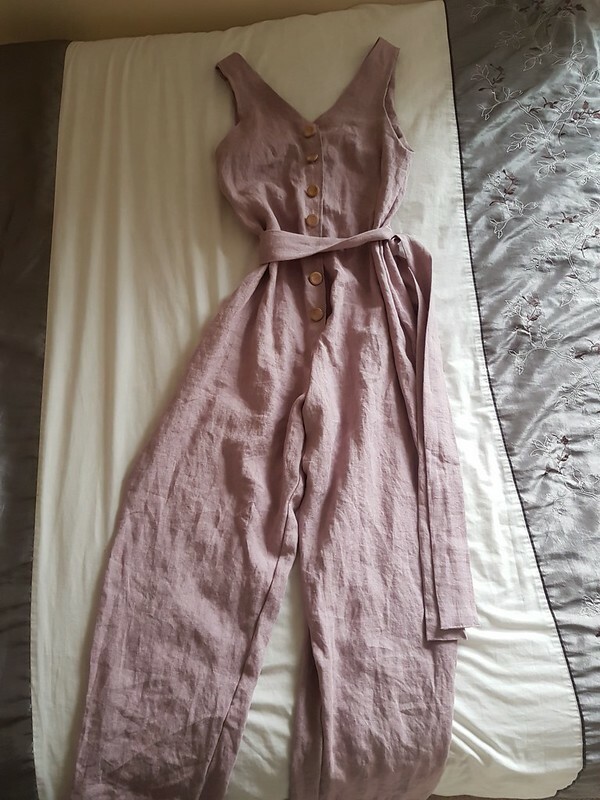 Sizing: size A-K I cut E, the size that fitted my pre pregnancy measurements and fingers crossed since it is loose fitting it will be accommodating of whatever size I am in summer! Were the instructions easy to follow? Yes the instructions were really great, as ever for these patterns. Likes/dislikes: A good design, well thought out instructions. Fabric used: this gorgeous linen from Merchant and Mills. Alterations/design changes? I removed the back zip and replaced it with a partial button placket in the front. Would I sew again? That depends on the fit when it is actually summer. I do like it though. This is the first time I have actually properly hacked a pattern. Normally I just lengthen or shorten patterns. 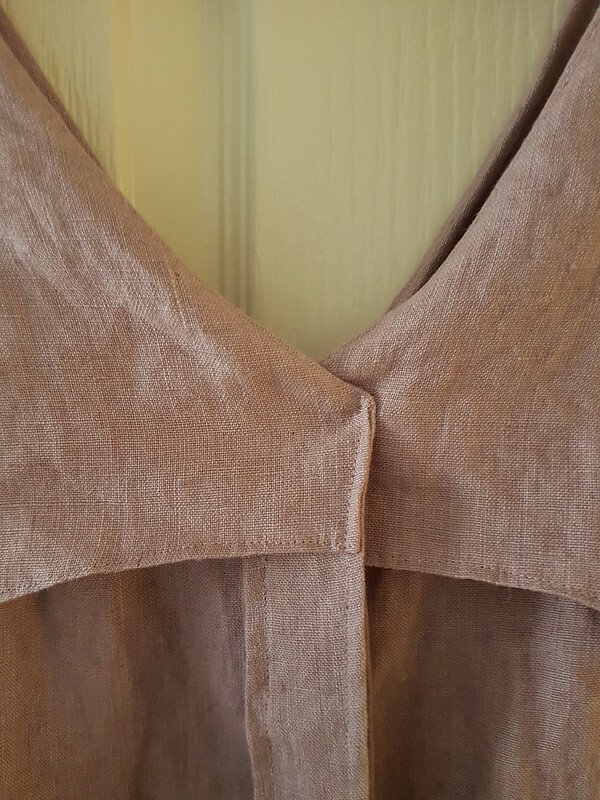 Adding the partial button placket involved a bit of googling to work out how to do it, I leaned heavily on the button placket used in the button up dress. I am really pleased with how it has worked out. Soft fluid lines with waist definition, the wooden buttons are an “earthy” accent. The linen is of course a nice slubby material. This ticks a lot of the boxes as a soft natural, so it will be interesting to see how it looks on in summer.